There's a mystery afoot and we are participating! Go over to Fat Quarter Shop's blog site for all the details. I've been told there are plenty of prizes too. Here's the list of designers and the dates they will be posting for the hop. Today's the day to visit Anne at Bunny Hill Designs. The links and dates are listed below. 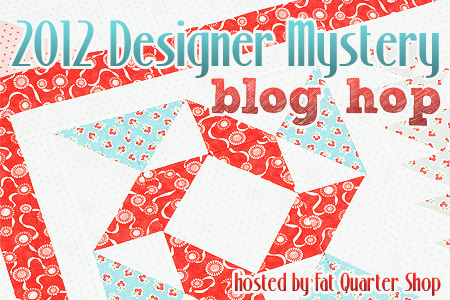 The fun part of the whole blog hop is the wonderful quilt shown above. It's made from the fabric line Vintage Modern by Bonnie and Camille for Moda. The quilt is Fat Quarter Shop's block of the month. 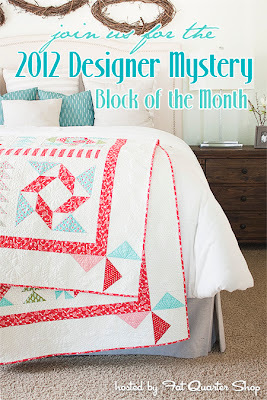 Each designer in the blog hop has designed a pieced block for the quilt....12 blocks in all. We have seen our blocks...but not the entire quilt. We only get a peek here but it looks marvelous! I can hardly wait to see the whole quilt. Happy Valentine's Day! Hope you day is sweet. Happy Valentine's Day! I love the look of that BOM, but I am just not quilting these days. Someday I'll get back to it. 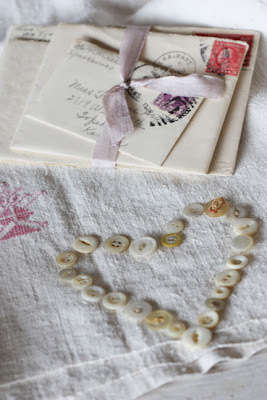 Love the button Heart on you vintage stamped cross-stitched cloth-Happy Valentines too! This is an interesting topic. A nice recreation on the other hand. This is my first commenting in this super blog post. You have posted this content long 7 years back on the Valentine’s Day. Even I too celebrated our first wedding anniversary on February 14. Celebrating Valentine’s Day and Wedding anniversary is much for loving. As you said, your article seems to be exceptional from that by other writers. I have never read article like this before. Actually I do not make comment on every post I visit. If I like any post, I will surely post comments. Writing is somehow a make-believe story writing in general. But in order to keep the readers thrilled, it should be well written with beauty. Being a writer, one can get good experience in writing with some flavors. Generally, a writer needs enormous vocabulary. And one also requires professional usage of the language. Usually, writers put some decorating words in their writing. This is to make their piece of writing exciting to read. This becomes the routine for a writer. However, a few years of practice will absolutely lead a writer to write a biography or a book of themselves. This is the starting stage of a new author within a writer. In your posts you have shared many important links about designers. Thank you so much for sharing this helpful designer links here. I hope that we can get unique designing ideas from the professionals. It is always interesting to check others works and tricks. Even I love to do different design. When I was in school I have got many prizes for designing different items. And I have got prizes also for unique woolen designs. I appreciate you for posting about the designers. I have checked most of the designer blogs. It is very excited to check such helpful links. I am very much happy to visit. And I am very much thankful for you to giving an opportunity to comment here. Your blog is so much energized. I am going to subscribe your blog if you have RSS feed. So that I can get updates as soon as you post it. I am going to share this blog with my friends circle. So they can get something really helpful post. Keep blogging! !